No, “Cinco de Mayo” celebrates the surprising victory of the Mexicans over the French invaders at the Battle of Puebla. Surprising, and the first sign—the first ray of hope—that the Mexicans could actually win. 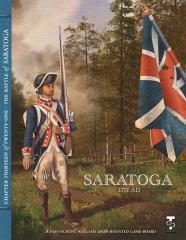 By that standard, the U.S. should celebrate October 17 as “Saratoga Day.” For of all the battles in the American Revolution, this campaign was the one that really gave the Patriots a belief that they could win—and convinced the outside world (starting with France) that the rebels were worth supporting. Take away the victory at Saratoga, and we can only wonder how much more time would have passed before the French alliance happened…if ever. Can you, as the British, salvage the campaign and avoid turning the rebellion into a world war? Can you, as the Americans, motivate “Granny Gates” into actually putting all his troops into action and creating the great victory that might have given him what he wanted (to replace Washington!)? The choices are yours, as you decide whether October 17 becomes an American or a British holiday.